This Sunday, the NFL features some very, very good games, as well as some games that you are probably going to skip over when flipping through your channels. One game that immediately caught my eye though is a 1pm kickoff between the Baltimore Ravens and the Washington Redskins. 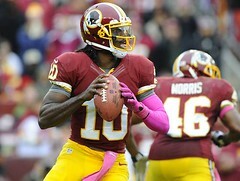 This game features two of the most electrifying players in the NFL in Ray Rice and Robert Griffin III. The Ravens have an impressive 9-3 record right now and have a firm hold on the top of the AFC North, while the Washington Redskins are coming off of their biggest win of the season against the New York Giants on Monday Night Football to go to 6-6, and leave themselves just one game back of the lead in the NFC East. This game will be played in Washington, and the Skins’ have won three straight to get that .500 record we mentioned above. If you are betting on NFL games – we highly recommend this online bookmaker! The Ravens got to that 9-3 record by fighting through any injuries or issues that have come up throughout this season, and they’ve been a very impressive team to this point. They just suffered another tough injury though as Terrell Suggs tore his bicep, but it is unknown whether or not he will be playing. The Ravens last game was a loss to the Pittsburgh Steelers and third string quarterback Charlie Batch on their home field, so they are definitely hoping to rebound in a big way. I think that they are going to need to get the ball to Ray Rice consistently to win this game, as Rice had zero touches in the fourth last game against the Steelers. The Redskins are believing right now. They are believing in a pair of rookies in Robert Griffin III and Alfred Morris, and also believing that their team can win the NFC East and get to the playoffs this year. It’s definitely possible, and the win last week proves that they can play with anyone. Their home crowd is going to be loud and ready to roll on Sunday, and you know that Griffin is going to be ready to play as well. Expect a heavy dose of RGIII on Sunday against the Ravens, who struggle against the run. I think that Griffin could have a big day on the ground and through the air. Heard Enough? Got your pick? Ready to wager? This online sportsbook is the best spot for you to bet. Oh yes, the Washington Redskins are favored by -2.5 over the Baltimore Ravens, and I believe that they should be. The Skins’ are playing excellent football right now, and they aren’t showing any signs of slowing up. 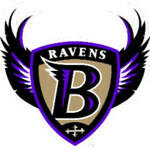 Three wins in a row is impressive, and they are on their home field against this injury plagued Ravens team. I do think that the Ravens are definitely a playoff team still, but I’m riding the hot hand right now with the Redskins. I’d love to get on this line before it moves to -3, so I’m going to be betting on the Redskins to win the game, and to do it by around 3-7 points. Redskins -2.5 is our bet and pick in this game.